I know that many of you are looking for card ideas for Christmas. 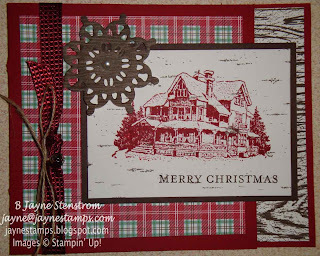 Today I have some gorgeous ones to show you made with the Christmas Lodge stamp set in the Holiday Mini catalog. 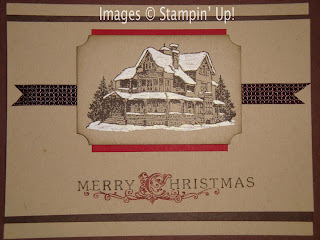 This is a beautiful stamp set that can be used for cards all winter long. I received this first card from Debra Currier from our Upscale Swap Group. She always has such clean and elegant cards. Crumb Cake, Early Espresso, and a touch of Cherry Cobbler are all that is needed for this card. She also layered the main image onto a piece of the Early Espresso 3/8" Quilted Satin Ribbon. The snow on the rooftop and around the lodge is colored using our White Gel Pen. This next one was from Deb Snyder from another swap group I'm in. It's hard to believe that these two cards were made from the same stamp set, isn't it? Deb used the smaller branch with the birds and framed them with the rectangle shape from the Designer Frames Textured Impressions Embossing Folders. She accented the folder with some Shimmer Paint to make it stand out. The DSP looks like a real birch tree, doesn't it? 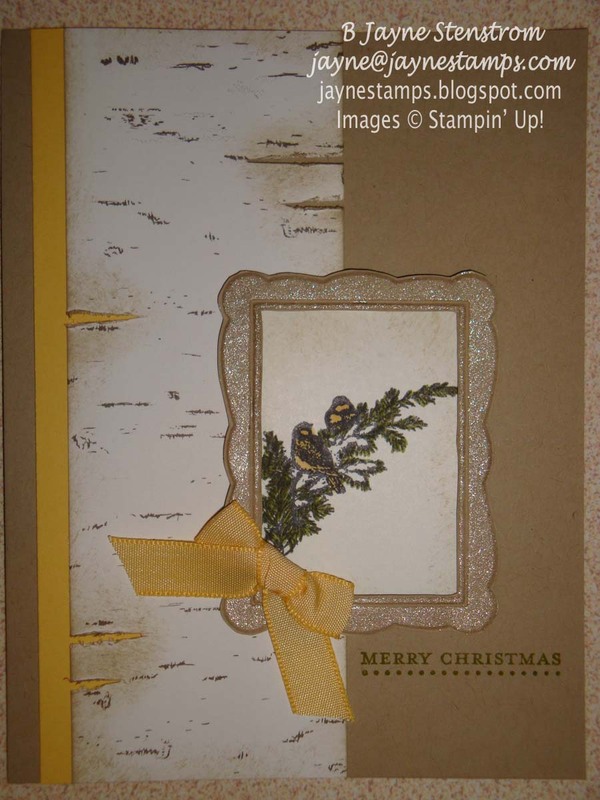 That is from the Frostwood Lodge Designer Series Paper pack. The touches of So Saffron in the cardstock and the 3/8" Taffeta Ribbon tie it all together. The last card for today was created by Joyce Feraco. 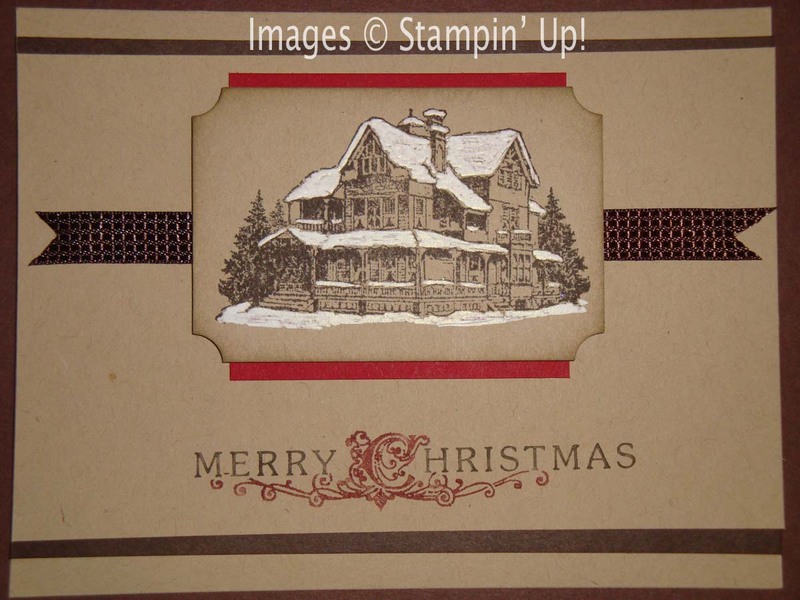 She stamped the lodge in Cherry Cobbler ink directly onto the same paper that Deb Snyder used. 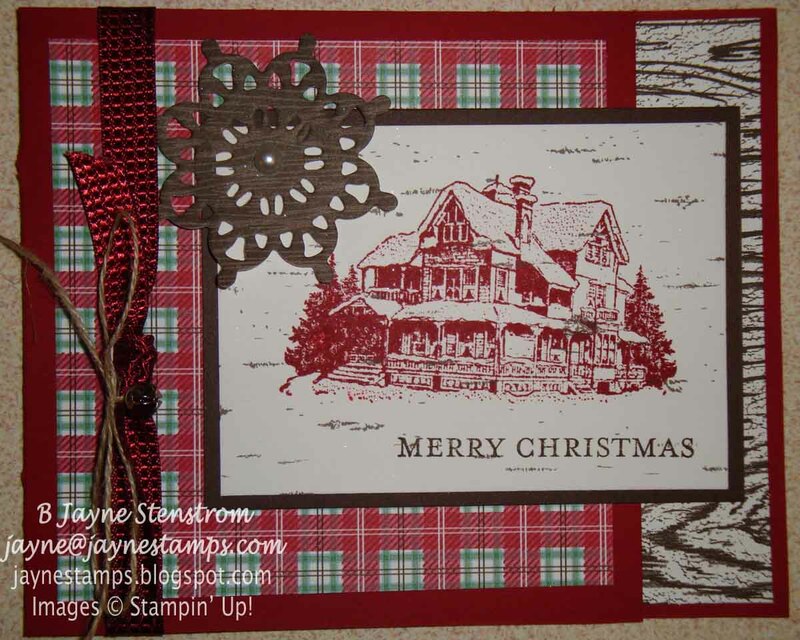 Joyce used four of the designs from the Frostwood Lodge DSP pack on her card. The snowflake is cut with some of the DSP using the Northern Frost Sizzlits Decorative Strip Die. She also accented her card with Cherry Cobbler 3/8" Quilted Satin Ribbon, some Linen Thread, and a Mini Jingle Bell (isn't it cute?). This is your last week to take advantage of the special offer to get a FREE Big Shot! Contact me if you'd like more information.